Coming south to live in Dorset, Verwood Transport was started by Andy Wood in April 1981. The buses were painted in the blue of Middlesbrough, reminiscent of Andy's Tees-side origins. The first vehicle was Bedford VAM SWP733F coach bought from Shaftesbury & District. This was joined by DCD19C a 64-seater double-deck former Brighton Corporation Leyland PD2, remembered by the owner as a 'great little mover'. Sister vehicle DCD20C was briefly owned in 1982 but not used. Next was a Ford R192 45-seater LSY140J. 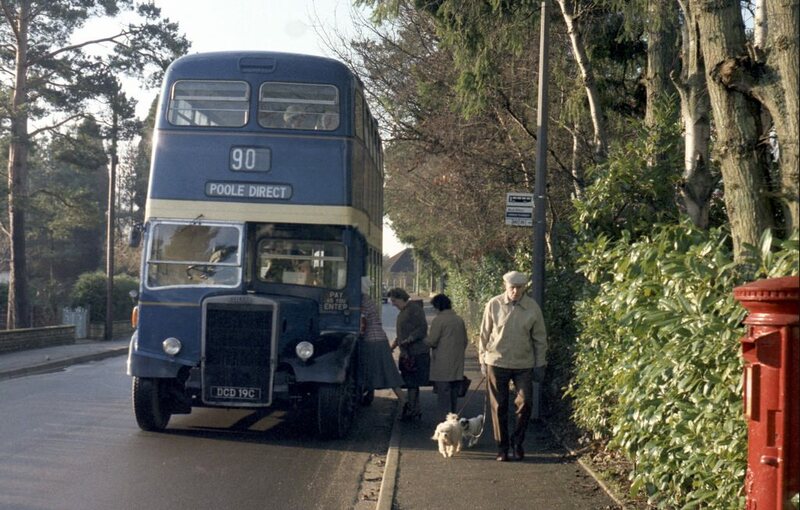 On 5th June 1981 the first bus service was started linking Verwood to Poole on Fridays (service 90). From 21st July Tuesday operation was added to the 90, whilst a second service 91 was started on 20th July from Verwood to Christchurch on Monday market day. Saturday operation of the 91 was added from 11th December 1982. The following year 1983 saw a short-lived service 92 from Verwood to Alderholt on Saturdays, connecting with the 91. This ran only from 4th June to 23rd July as Dorset County Council school work was altered at the time to require only double-deckers, and as low trees on the road to Alderholt made the use of deckers difficult, the Leopard used was replaced with an ex-Reading VR XRD25K and the Alderholt service had to go. With the 90 and 91 having originally been operated as 'direct' services they were changed to carry local passengers from May 1986. Changes were coming! Deregulation of local bus services in 1986 enabled an enhanced network of services to be introduced from 27th October with six days a week operation. The 90 now went from Verwood / West Moors to both Poole and Bournemouth from Monday to Friday, and the 91 went from Verwood / West Moors to Bournemouth and Christchurch also from Monday to Friday. The 92 was now an early morning run on Monday to Friday from Verwood / West Moors via Ferndown to Bournemouth and returning immediately. 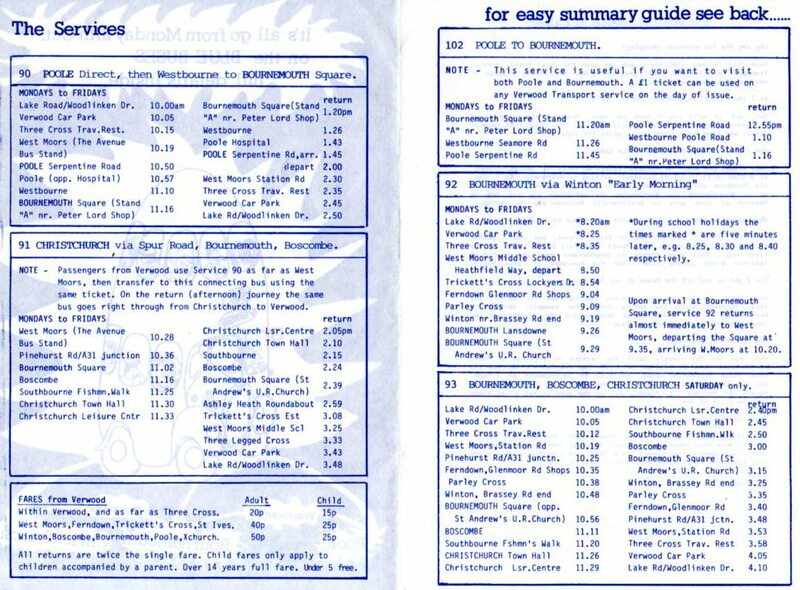 The 93 was the only Saturday service, going from Verwood / West Moors via Ferndown to Bournemouth and Christchurch. When the bus working the 90 arrived in Bournemouth it worked a return trip to and from Poole as service 102 to enable the layover time to be spent at Poole rather than in central Bournemouth. The forward journey in the morning on the 92 and the afternoon return journey on the 91 enabled a schools service to be worked into the timetables between Verwood and West Moors Middle School. In April 1987 the 92 was curtailed to just run the school route to West Moors, no longer going through to Bournemouth, and the Saturday 93 was withdrawn. In compensation the 91 was increased to include Saturday operation. From Wednesday 22nd April 1987 a new weekly service 94 was introduced from Verwood to Southampton. This bus service ran for four months only but continued a little longer on an excursion basis in the pre-Christmas period. But an unwelcome competitive service now appeared in the guise of Wilts & Dorset service 90 running ten minutes ahead of the Verwood Transport timings from 26th May 1987. A year later on 1st September 1988 Roger Brown (who had founded Shaftesbury & District) took over at Verwood Transport, although Andy continued to drive for the firm. On the first day RMA37 was used, one of a batch of 65 'Routemasters' with front power doors designed to work express services to Heathrow Airport. With authorisation for a fleet of six vehicles the base was moved from Verwood Caravans yard to Sutton Farm in December 1988. A new bus route was gained in November 1988 on Dorset county council tender, the 182 from Witchampton through the Tarrants to Blandford on Thursday and Saturday. This had previously been operated for many years by Stanbridge and Crichel and was now extended back to commence at Verwood on Thursday. School work included the 92 to West Moors and two rural runs around Sixpenny Handley. Somewhat surprisingly after just five months the business was sold to Wilts & Dorset from 1st February 1989. Subsequently they withdrew their competitive 90 from 24th April, whilst maintaining the original Verwood Transport 90, now renumbered to 90A. 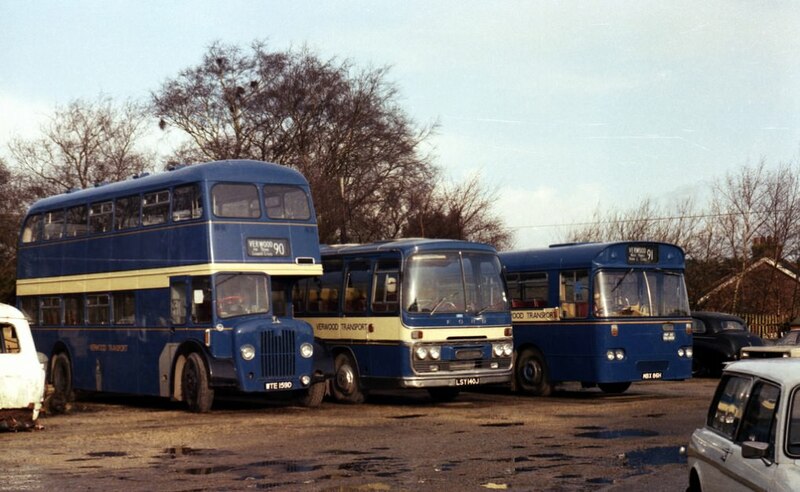 One of the W&D buses was painted blue and carried the Verwood Transport fleet name. Two years pass with no independent bus activity and then with the start of the September school term in 1991 Roger Brown reappears as Verwood & District on the Verwood to West Moors school contract, initially using ex-Nottingham City Transport Fleetline NNN99K. From 5th November 1991 the 90 is restarted from Verwood to Poole on Tuesday and Friday, in direct competition of course with Wilts & Dorset! A fares war ensues, and Andy Wood is driving for Roger Brown again. A weekly service on Wednesday is started on 4th March 1992 from West Moors and Verwood to Ringwood, followed by resumption of the 91 to Christchurch from Saturday 25th April. From 1st June 1992 the business is once again taken over by Andy Wood, who returns south from working in Hull. The Ringwood service runs for the last time on 10th June and the last day of the Saturday service to Christchurch is 18th July, followed by the suspension of the 90 to Poole after Friday 24th July. No buses are run during the summer school holiday period. September saw a relaunch as Verwoodbus with a weekly service V1 from Verwood and West Moors to Bournemouth and Poole starting on Friday 4th September. The school service to West Moors recommenced on Wednesday 9th September. Fleetline NNN99K continued as the workhorse for the new firm until it failed in March 2001. The replacement was Bristol VR VCA455W which gave sterling service until October 2010. From February 2008 a Tuesday service was added to the V1, but starting only from West Moors. At the same time the route was diverted via the centre of Ferndown then Glenwood Road and Ellesfield Road, replacing an abandoned W&D route. The V1 last served Verwood on Friday 20th June 2008, starting from West Moors in future. The most recent alteration was the discontinuance of the Tuesday running after 20th July 2010. From the autumn of 2010 the route was being run with hired Shaftesbury & District red front entrance Routemaster RME 1. The V1 ceased running at the end of July 2011 because of the loss of the associated school contract.